My son, who turns six in May, didn’t want to keep working on his dictation assignment for kindergarten. The task called for me to read a short sentence, which he would then write on the paper. He’d had a decent day at school – even completed his in-class work – but it was late afternoon and I sensed he was tired. I didn’t want him to quit, though. We were halfway through this. I just wanted him to finish. But he wouldn’t. “No,” he said, shaking his head. “Yes,” I said. Calm, but firm. Fists clenched. Tears streamed from squinted eyes. “NOOOOO!” But he was already climbing down from the chair at our high kitchen table and stomping toward the stairs. While this went on, I plucked my iPhone off the counter and opened the web browser. 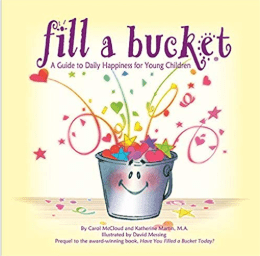 Apparently, a teacher at school had read the students a book called Fill A Bucket. I’d never heard of it before, but the premise is that, as the boy related, everyone’s got a bucket and when you do nice things for people, you fill their buckets. When you do bad things, you take from them. You’re a bucket dipper. Well. I wasn’t going to settle for that. “Get down here,” I said up the stairwell. Sullen, he made his way back down. “It happens,” I told him. To a lot of people, kids and grownups alike. More often than I dared admit.